From the team that brought you The Chain – The Fleetwood Mac story, the production will be presented by Rhumbelow Theatre at Tina’s Hotel in Kloof from March 20 to 25. 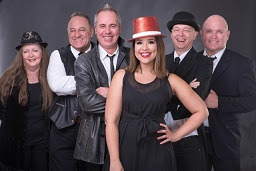 Featuring Durban’s finest tribute band ‘The Reals’, the line-up is augmented by the ever-inspiring Samantha Landers and guitarist Colin Peddie. You just know this is a winning formula. Devised by Colin Peddie, the show will showcase material which is more lyrically driven, but without losing the punch which accompanies popular music. There will be artists like The Eagles, Bob Dylan, Leonard Cohen, Mumford and Sons, Paul Simon and many more. Integrating the use of AV and sound bites and the live elements, the group intends to take you on a musical journey of thought-provoking poetry and foot-stomping music. The cast is led on keyboards and vocals by musical director Dawn Selby, with Mali Sewell (drums/vocal); Jason Andrew (bass/vocal); Barry Thomson (guitar/vocal); Colin Peddie (guitar/vocal) and Samantha Landers (vocal). Shows take place from March 20 to 26 as follows: Monday to Saturday at 20h00 and Sunday at 14h00.